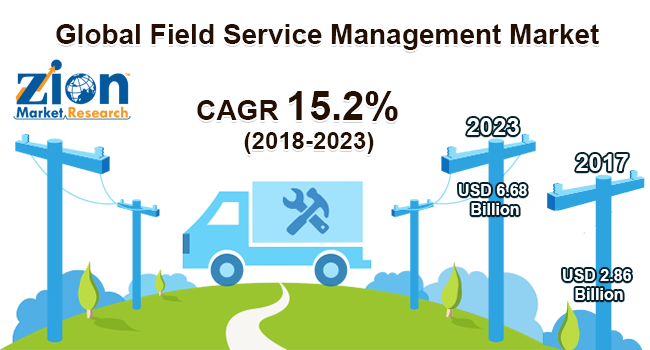 Global field service management market expected to reach USD 6.68 Billion by 2023, growing at a CAGR of around 15.2% between 2018 and 2023. Field service management is a framework for planning field tasks through a mobile workforce. At an essential level, this involves scheduling service orders, dispatching agents, and tracking vehicle locations and job status. The report covers forecast and analysis for the field service management market on a global and regional level. The study provides historic data of 2015, 2016 and 2017 along with a forecast from 2018 to 2023 based on revenue (USD Billion). The study includes drivers and restraints for the field service management market along with the impact they have on the demand over the forecast period. Additionally, the report includes the study of opportunities available in the field service management market on a global level. In order to give the users of this report a comprehensive view of the field service management market, we have included a detailed competitive scenario and product portfolio of key vendors. To understand the competitive landscape in the market, an analysis of Porter’s five forces model for the field service management market has also been included. The study encompasses a market attractiveness analysis, wherein all segments are benchmarked based on their market size, growth rate, and general attractiveness. Field service management market is segmented based on the solution, deployment mode, vertical and region. Solution segments included in this market are work order management, inventory management, customer management, mobile field service management, schedule, dispatch & route optimization, billing, invoicing & mobile payments and others. Deployment mode segment includes on-premises and cloud. The vertical segment includes BFSI, manufacturing, telecom & IT, retail, transportation & logistics, healthcare and others. The regional segmentation includes the current and forecast demand for North America, Europe, Asia Pacific, Latin America and the Middle East and Africa with its further bifurcation into major countries including U.S., France, UK, Germany, China, India, Japan, and Brazil. The report covers detailed competitive outlook including company profiles of the key participants operating in the global field service management market. Key players profiled in this report include Oracle Corporation, SAP SE, ClickSoftware Technologies Ltd., Astea International Inc., Coresystems AG, IFS AB, Microsoft Corporation, Praxedo, Retriever Communications Pty Ltd., and ServiceMax, Inc.